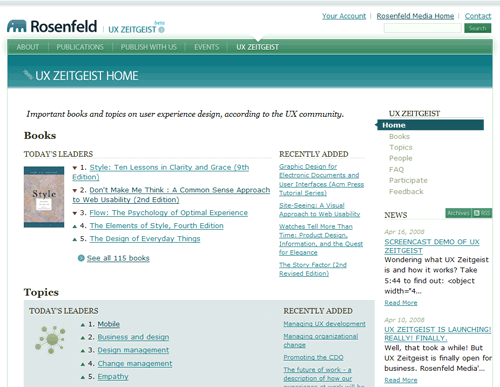 I’ve just ordered a couple of books at Rosenfeld media and while finishing the order I noticed a part of the site called UX Zeitgeist which consists of a huge collection of books and topics on user experience design. the German word for ‘time?spirit’, more often translated as ‘spirit of the age’. It usually refers to the prevailing mood or attitude of a given period. They also provide information and links about the book from different web services like del.icio.us and Google Blog Search. You can sort the list by several criteria, and it’s really a very useful resource if you’re interested in UX design. So if your looking for books to read, you have a pretty rich list right there to choose from.